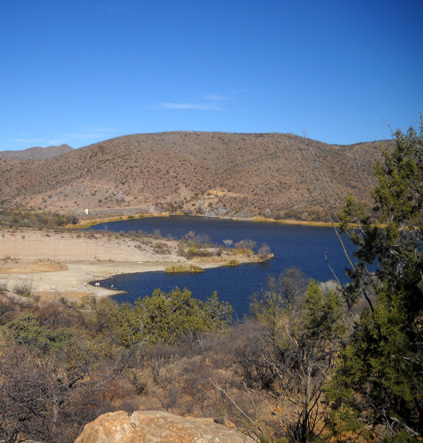 riparian area and its surrounding environment." 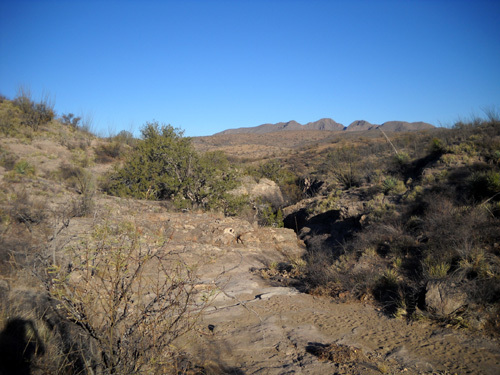 We really enjoyed a run/hike this morning through part of this scenic natural area, originally established in 1994 after the acquisition of almost 5,000 acres of land along Sonoita (so-no-eet' a) Creek, just downstream from Patagonia Lake in southeastern Arizona. It has been enlarged by several thousand more acres since then. 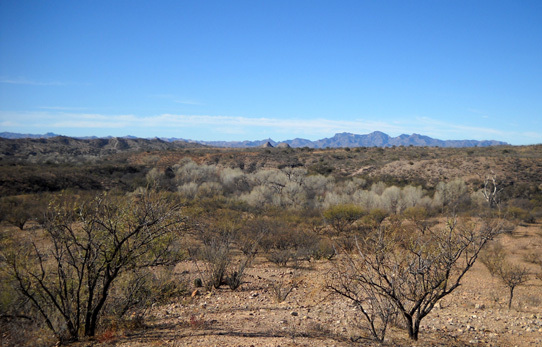 Both Patagonia Lake State Park and Sonoita Creek State Natural Area (SCSNA) are managed by Arizona's state park system. 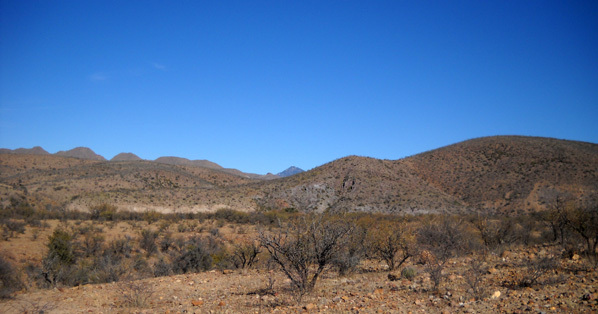 This webpage has a good history of the various land acquisitions and reasons for protecting this unique environment, which lies in a transitional zone between the Sonoran Desert and the Chichuahuan Desert. Click here for a larger view (pdf. 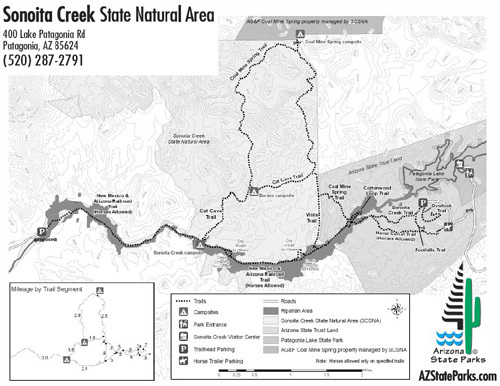 file) of the Natural Area and its trails. 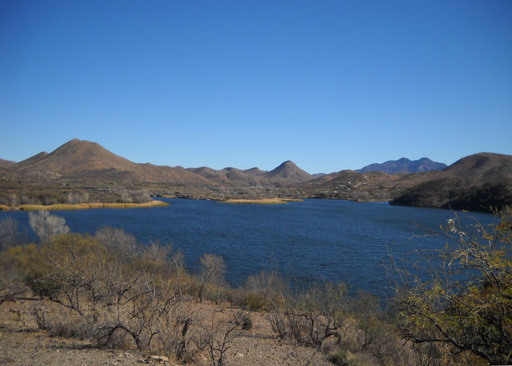 Patagonia Lake State Park is on the right. 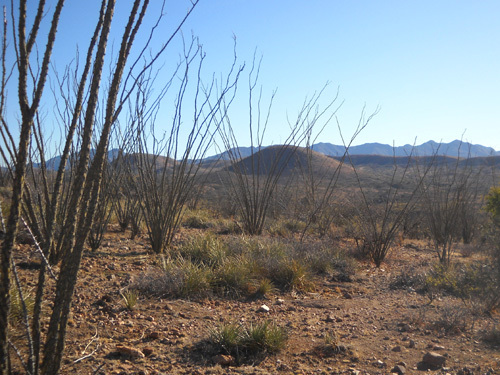 Per a SCSNA brochure we picked up in the nearby Patagonia Lake SP office, the visual and biological characteristics of the seven distinct eco-systems within the natural area are markedly different and their presence in a relatively small area is quite rare. I was able to distinguish several of the different vegetative communities and have included photos of them throughout this entry. 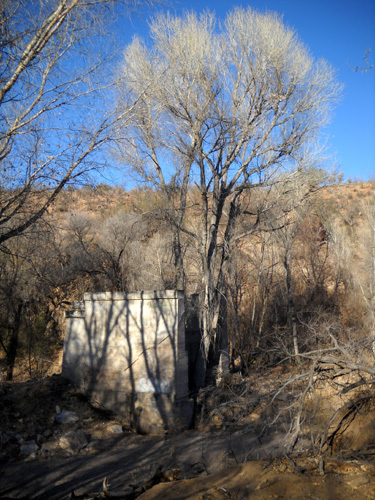 Sonoita Creek flows into Patagonia Lake from the northeast, over the dam at the southeastern end of the lake, and through the SCSNA for several miles. 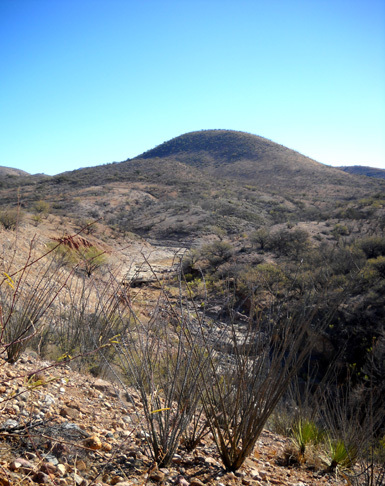 From there it dumps into the Santa Cruz River downstream. 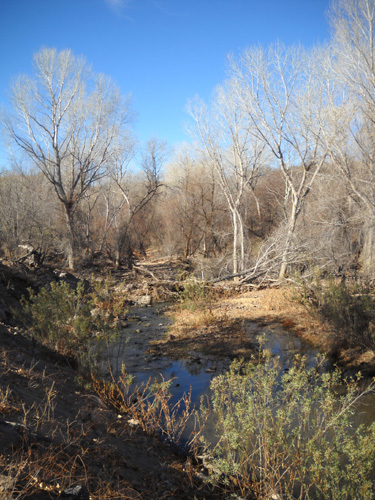 It is one of the few perennial streams we saw in the area; most of the others were dry washes. 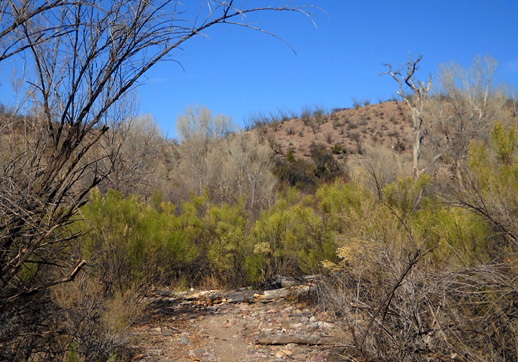 The primary management goals are to protect, maintain, and restore the diverse native wildlife and riparian/upland habitats within the Natural Area, to protect cultural and historical resources and artifacts, and to provide opportunities for "appropriate" recreation, environmental education, and scientific research. 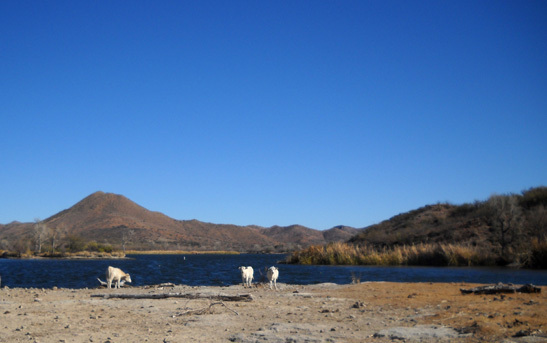 Numerous species of mammals, reptiles, amphibians, and native and migratory birds live in the Natural Area. 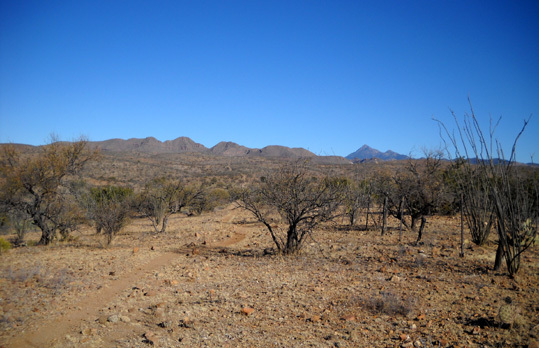 Because of the unique biodiversity the area is conserved as much as possible in its natural state. That means lots of rules and regulations. There are strict rules about the number and types of visitors allowed in each day. 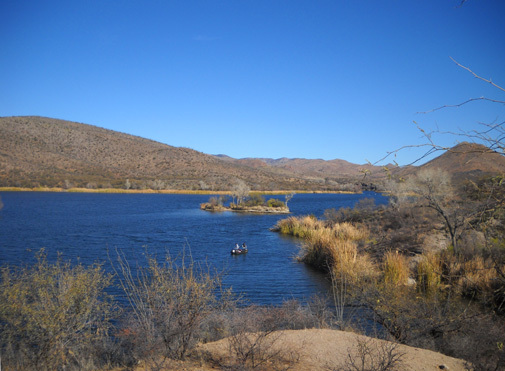 Visitors must sign up at the state park office and obtain a permit (price included in park entry or camping fee). 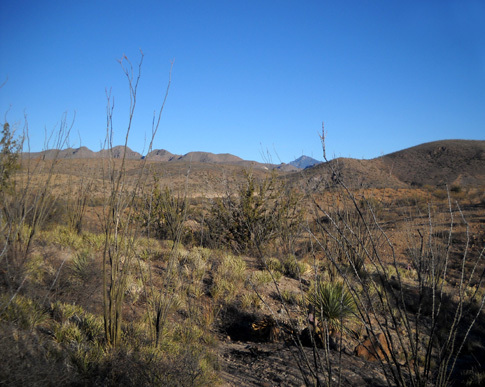 Activities in the natural area are also strictly limited to those that are low-impact in order to help preserve endangered species and native habitats. 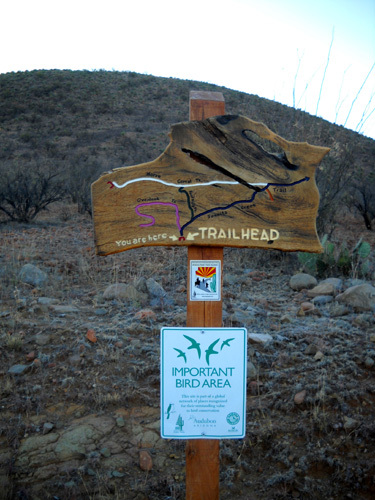 Hikers/birders/runners may use all twenty-two miles of trails. 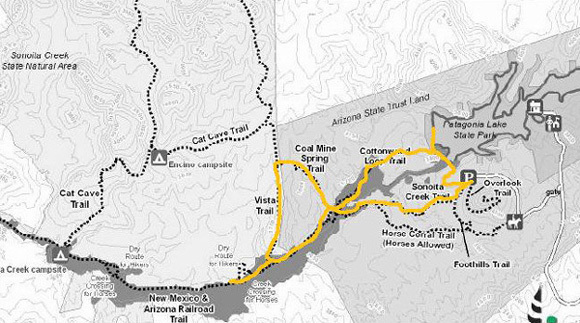 Horses may use only the Horse Corral Trail and the New Mexico & Arizona RR Trail, which is built on a former railroad bed. Dogs are allowed on leash (that surprised me a little bit). No bicycles or motorized vehicles are allowed. Hikers may camp in the back country (with a permit) but there are no other camping facilities or restrooms. Even horses are not allowed to remain overnight in the natural area. You can camp, as we did, in the adjacent state park. Despite -- or maybe because of -- all the rules, we figured this would be a great place to hike. We were right. 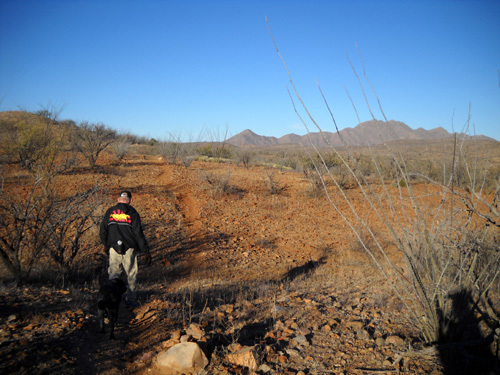 Not only was the terrain varied and interesting, we had the place to ourselves on this beautiful weekday morning. Oh, there was plenty of wildlife . . . but no other humans we could see. I loved the solitude and being able to enjoy all the sounds of nature. 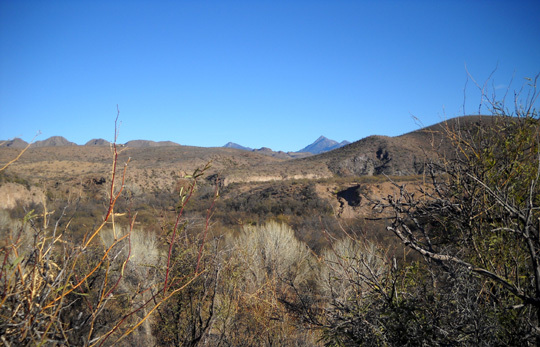 Jim, Cody, and I started this morning's hike in the Natural Area from the trailhead parking area above the southern end of Patagonia Lake. There is a gravel access road off the paved park road, with a corral part way back for equestrians to begin their rides. 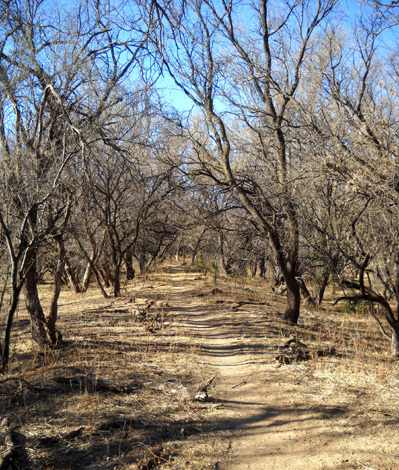 They merge later with hikers on the Sonoita Creek Trail. 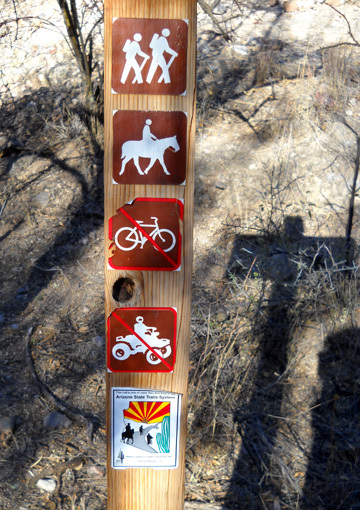 We did not have time today to explore the entire trail system within the Natural Area. 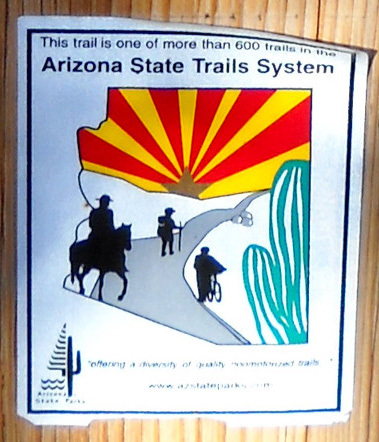 We're pleased with the loops we chose and hope to run/hike the rest of the trail system on a future visit. 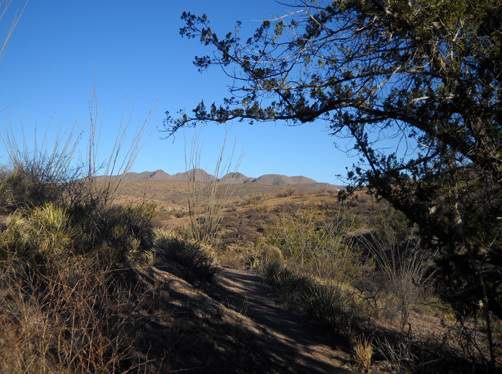 We started off together heading west on the Sonoita Creek Trail through hilly desert terrain with views of the mountain peaks surrounding us (below) and glimpses of the city of Nogales to our south. 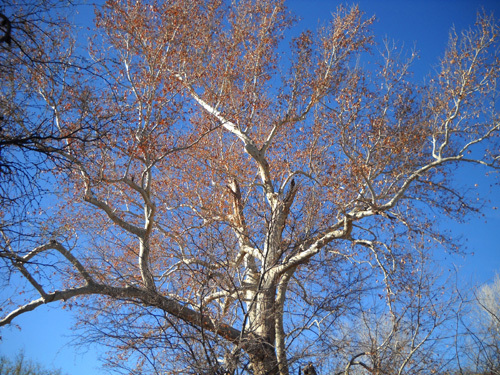 This is the location of the Cottonwood Loop trailheads and a large stand of magnificent, tall cottonwood trees. 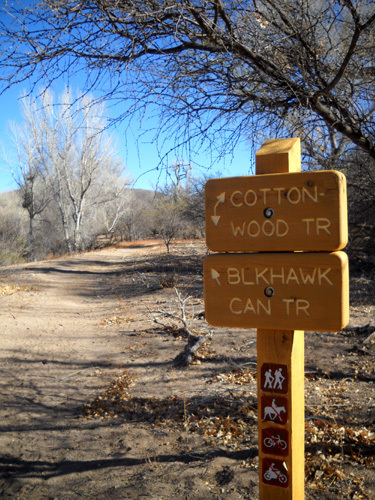 Jim went right (NE) on Cottonwood and looped back in the clockwise direction to the truck on a new 2.75-mile trail not shown on the maps in this entry, the Blackhawk Canyon Trail. I just drew it in on the map below. 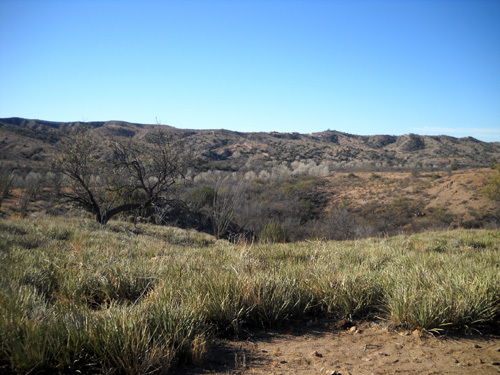 Cody and I headed the other direction (SW) across the dry creek, across wet Sonoita Creek, up the bank onto the old rail bed (NM & AZ Railroad Trail), and right (N) onto several miles of trail reserved for foot travel only (piles of horse poop indicate someone took horses into the upland habitats anyway). 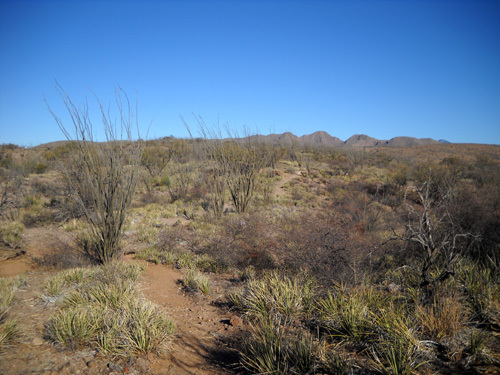 I hiked both loops in a figure-8, with several out-and-backs to satisfy my curiosity. I turned left when I reached the Vista Trail and immediately wished I'd gone the other direction on this loop. Although I had wonderful panoramic views, the mountains behind me to the north (next photo) were the most scenic and I had to keep stopping to turn around so I didn't miss anything! 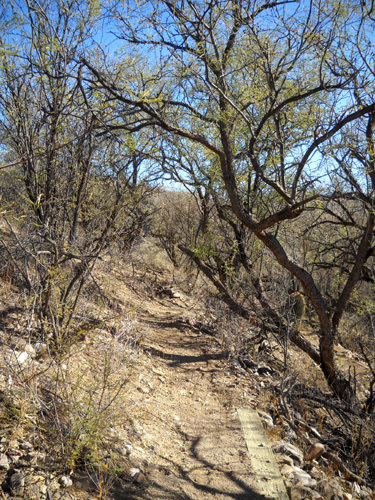 The upper Vista Trail, before it begins a dramatic drop to the rail trail and creek, is very runnable in either direction. On the way downhill I entered another ecosystem of short trees with pretty green fern-like leaves . . . I turned right (west) on that trail for about half a mile before turning around. The scenery didn't change much. The rail trail continues on for over five miles from there. The part I saw was smooth and mostly flat, excellent for running. 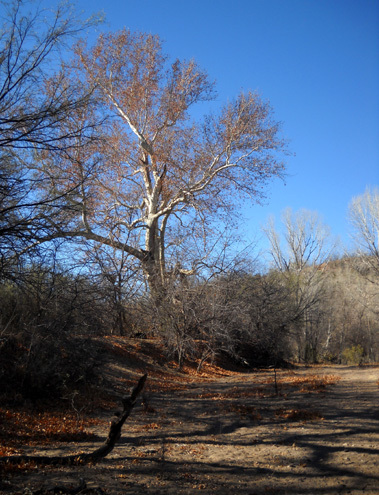 The Cottonwood Loop winds through one of the seven distinct habitats in the Natural Area. 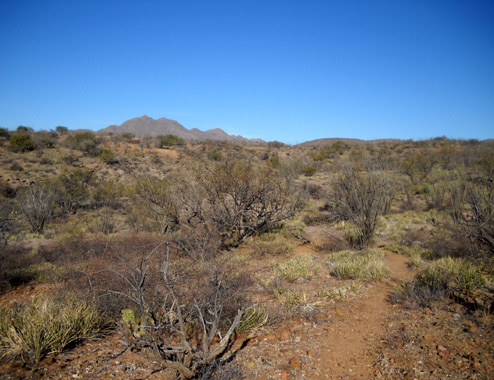 I walked around most of that loop before heading back toward the new Blackhawk Canyon Trail. 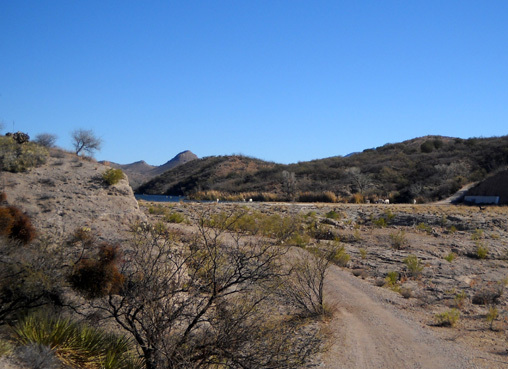 The Blackhawk Canyon Trail ends at a gravel service road that runs between the spillway (to the right) and the dam (toward the left) at the southeastern end of Patagonia Lake. I was almost as surprised a few minutes later when Jim picked me up to hear that the cows weren't there 90 minutes earlier when he crossed the spillway. They move around a lot in search of food. From the spillway it's a very steep hike uphill on the service road to the SCSNA parking area. It was worth it for the views back down to the lake, however. How beautiful! Two anglers were trying their luck on the lake, which supports bass, bluegill, catfish, and crappie. Trout is also stocked every three weeks from October through March. Too bad we don't fish; fresh grilled trout is awesome! My double loop with several out-and-backs added up to only seven or eight miles but it took me 2� hours of running (a little) and walking (a lot) because I was distracted so many times by the beautiful vistas, plants, and animals around me. What a great hike! It was my favorite part of our weekend in the Patagonia area. I recommend you check it out. After getting cleaned up and eating lunch back at the camper, Jim and I resumed our journey eastward this afternoon. We followed US 82 to the junction of US 90 north of Ft. Huachucha. Both roads are scenic and fast. I enjoyed the mountain ranges on either side of four-lane US 90 as we drove north. 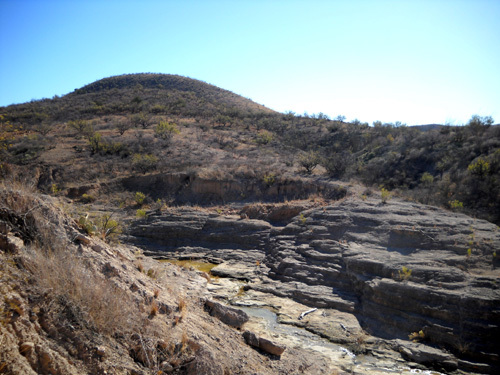 I'd like to return someday to visit Karchner Caverns State Park in the Whetstone Range and the historic town of Tombstone to the east. We hit I-10 in Benson, AZ and headed east. The only rest area that is still open in Arizona is the scenic one near all the huge rocks at the Texas Canyon Summit near mile marker 320. We didn't need to stop there this time. 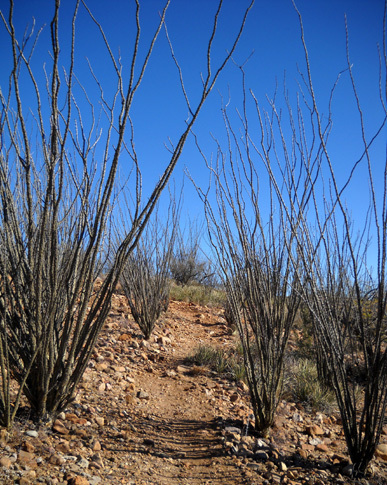 I'll talk more about Arizona's serious fiscal problems and resultant park and rest area closures in another entry. We followed I-10 through southern New Mexico to the WalMart at exit 140 in Las Cruces, where we will spend the night. The parking lot is very large; we're sharing it with six or seven other RVs at our end and several more at the other end. 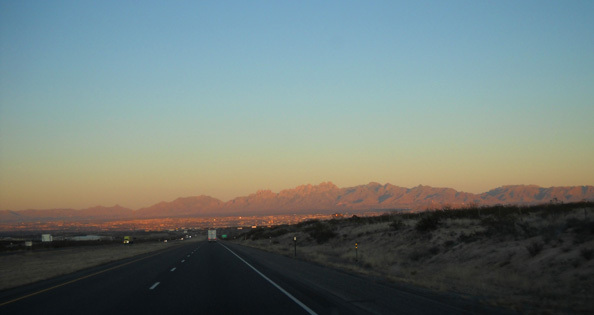 The setting sun colors the Organ Mountains as we approach Las Cruces from the west. We covered 299 miles today, which is fewer miles than usual when we're headed from Point A to Point B -- much nicer than cranking out 500 miles or more! It was 65�F. and sunny when we left Patagonia around noon. New Mexico is very chilly in comparison, even though it is about the same elevation and not all that much farther north. It is supposed to dip below freezing here tonight. Most of the country is in a deep freeze right now and the arctic air mass is slowly heading south toward southern Texas, where we're headed. I think our warm weather is about over!